Where: At intersections where a one-way road joins another road. 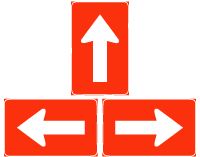 Purpose: To indicate that there is a one-way carriageway to the left, right, or ahead. Action: Proceed in the direction of the arrow only if you want to use that specific carriageway.